If you have been watching our site you know that we have taken dogs from Turkey. For those of you who have not been following our rescue efforts in Turkey I have provided some brief background information. 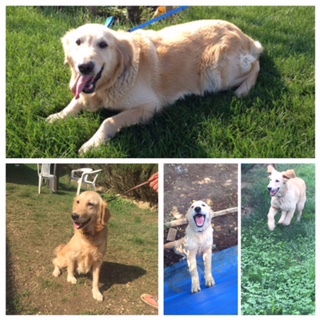 Golden Retreivers were very popular in Turkey, at some point they lost their wide appeal. Many of these dogs were abandoned on the streets and in the forests. 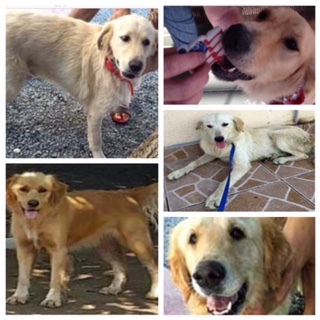 Recently, there were as many as 500 Golden Retrievers in the shelters in Turkey. A visitor to Turkey was shocked by what she saw and contacted a Golden Retriever Rescue group in Atlanta. In the past few months Golden Retriever groups from all over the United States have stepped up to help these dogs. We anxiously awaited our second group of dogs. They arrived in November 2015. Since that time we have taken many dogs from Turkey. Each dog has found a wonderful and loving family. You can read some of their stories below. Chelsea (formerly known as Hillary) joined our family in July 2016. She was rescued from a forest in Turkey, and we were prepared for her to be wild. But from the moment we met Chelsea she has been the sweetest, gentlest, most affectionate dog we have ever met. She graduated at the top of her class from obedience school and was named "Miss Congeniality" by the instructor. Chelsea will happily sit with her head in our laps for hours getting pets, but she also loves long walks, running on the beach, and swimming. She gets along with everyone she meets (human and canine). We can&apos;t imagine our lives without her! From the moment we met Connor & he jumped into my arms to greet me, we knew. Like most toddlers, Connor is a ball of affection, energy & mischief! He adjusted to family life quickly. It took a full year for him to finally "give paw" and enjoy playing with other dogs, but it took only a moment for him to steal our hearts. He loves our long walk/runs, loves his food & now enjoys trying pieces of apple, carrots, lettuce & all the healthy snacks his big bro Copper enjoys. Loves stealing all the toys from Copper too. Most mornings, he waits until 5 am to jump into bed & fall back to sleep with Mom & Dad. We just celebrated our 2nd year as parents to 2 LIGRR boys. Couldn&apos;t be happier or more grateful. Stuffing (formally known as Danielle) is loving her life in America. She loves to play fetch, go for walks around the neighborhood and play with all her doggie friends. She is loving, snuggly, and always wants to be right next to you. She has been the perfect addition to our family! July 2016, Stephen and I met Brodie, originally named Dean, and we instantly fell in love. We had waited a long time, until the right time, to get our first dog. Since that day, Brodie has been a great companion. He loves to run in our backyard and play fetch. We go on daily walks together and hikes on the weekends. When we are outside, Brodie is too. He loves to sun himself on our patio. When we are relaxing, we can count on Brodie to snuggle with us on the couch. Brodie will do just about anything for a treat and can be your best friend instantly. He loves attention and resting his head on your knee. His cute face is hard to resist. Our family has embraced Brodie as well. He loves our young nieces and our parents look forward to his kind spirit when they come to visit us. Brodie has been a gift to us and we are thankful everyday that he is a part of our family. We want to take this time to thank those who continue to help us save these dogs.